a case report from the first REBOA placed in Afghanistan. Background: Non compressible torso hemorrhage continues to be the leading cause of preventable death in combat operations. Resuscitative endovascular balloon occlusion of the aorta (REBOA) has emerged as an alternative hemorrhage control strategy, with morbidity advantages over resuscitative thoracotomy. We report the first ever use of REBOA in a combat casualty in Afghanistan. Case Report: An 18 year old Afghan male was injured by a single high velocity gunshot wound during partnered operations. He was treated with a damage control operation at the role 2 level, with significant presacral and pelvic bleeding controlled with combat gauze packing. The patient continued to be hemodynamically labile, with ongoing transfusion requirements and required emergent re-exploration. Upon transfer from the gurney to the operating table the patient was noted to be hypotensive with a blood pressure of 62/38. An ER-REBOA catheter was measured for Zone 1 occlusion and placed without difficulty. The patient’s hemodynamics normalized, which allowed for sterile entry into the abdomen and vascular control. After 10 minutes of occlusion the balloon was deflated. Surgical repair was completed and patient survived to discharge. Conclusions: REBOA is an adjunct to hemorrhagic shock that provides temporary proximal control bridge to definitive surgical hemostasis while avoiding the morbidity of a resuscitative thoracotomy. This case represents the first reported use of REBOA in the Afghanistan Theater. This case further supports increased consideration for use of REBOA in the forward setting. GLASER, Jacob J et al. Resuscitative Endovascular Balloon Occlusion of the Aorta (REBOA) as an adjunct to damage control surgery for combat trauma. 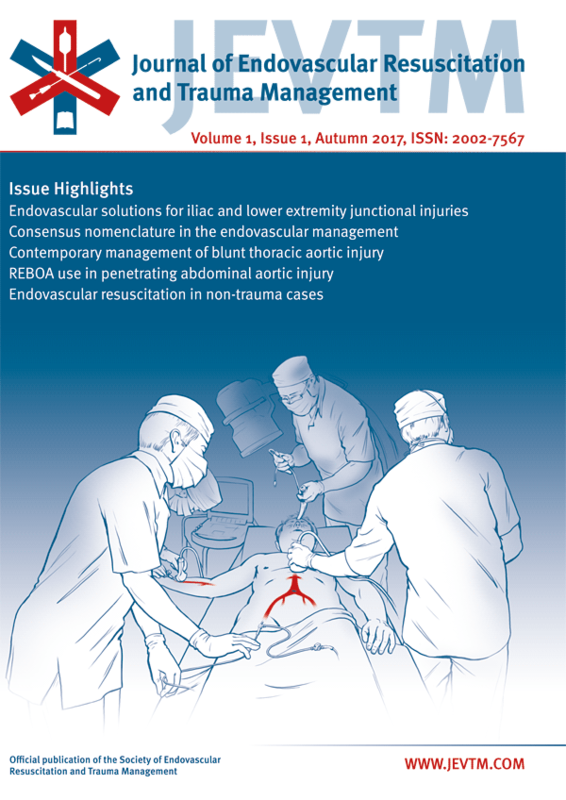 Journal of Endovascular Resuscitation and Trauma Management, [S.l. ], v. 1, n. 1, p. 58-62, aug. 2017. ISSN 2002-7567. Available at: <http://www.jevtm.com/journal/index.php/jevtm/article/view/16>. Date accessed: 26 apr. 2019. doi: https://doi.org/10.26676/jevtm.v1i1.16.